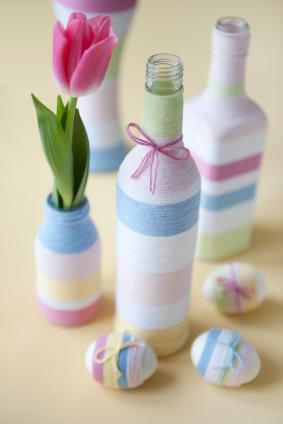 This Easter, try making some craft projects that will add a homemade touch to your celebration. Your guests will be impressed by your handiwork. If you happen to have leftover yarn from other crafts, this Easter vase project provides a great way to use it up. You can group the vases together for your celebration and then give them away as gifts if you like. Squeeze out some tacky glue on a paper plate and apply the glue to the lowest inch or two of your bottle using your sponge paint brush. Working quickly, begin carefully wrapping your first color of yarn around the bottle and working your way up in a single layer with no spacing between the strands. Snip off the yarn and press the end in the glue when you're ready to switch to the next color. Paint on another section of glue, and begin with next color of yarn, making sure you begin wrapping where you left off. Repeat adding glue and wrapping with different colors until you've completely covered the bottle. Repeat the process for each bottle vase you want to make. Once the glue is completely dry, you can add some tulips, lilacs, lilies or other spring flowers associated with the Easter season. This craft project offers a wonderful way to express the religious aspect of this holiday. Once you've made one of these pins and see how easy it is to make, you might want to make a few more as gifts for others. Unless your twigs or branch sections already seem the ideal size for your cross, cut a section that is about 3-inches long for the main beam, and another section that is about 2-inches long for the cross beam. Laying the cross beam on top of the main beam, tie one end of your embroidery floss around both beams at a cross angle to anchor them together, leaving a bit of extra floss hanging free to tie off at step 4. Now continue wrapping the cord tightly around the twigs, first around one angle and then alternating to the opposite angle like an "X." Wrap just enough cord to bind the sticks together as a cross, and then cut the cord off from the rest of the floss leaving about 6 extra inches at the end. Tie off the cord at the back of the cross using the end of the cord from when you first tied on. Make sure the cord is very tight when you tie the knot so the sticks are still held firmly in place. When your knot is securely tied, trim off the excess to about 1/8 of an inch so it doesn't show from the front. Using your hot glue gun, run a thick bead of glue on the base of the pin back, and quickly but gently press the back of your cross onto the glue. You want to press just hard enough for the stick to set securely in the glue without making the glue squish out from behind. Allow a few minutes for the glue to cool and harden completely, and then your Easter cross pin is ready to wear. 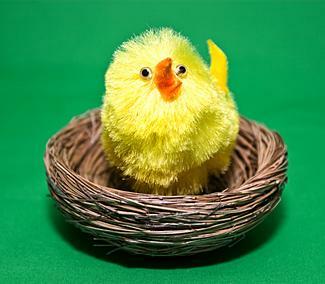 Remember those darling little plush Easter chicks people sometimes include in Easter baskets? You can make your own from pom poms. Secure each eye to the head with a single dot of tacky glue. Let them dry. Cut out a small triangle from the felt to use for the chick's beak, glue it on, and let it dry. Cut two wing shapes from the yellow felt, and glue one on either side. Cut a triangle from the yellow felt for the tail, fold it in half over a dot of glue, and then glue it to the chick's rear so the tail sticks out a little. Cut out two triangles from the felt for the feet. One point of each triangle will be the back of each foot. Make triangular cuts at the front of each foot to create three toes. Glue the feet to the bottom of the body and allow the glue to dry completely. 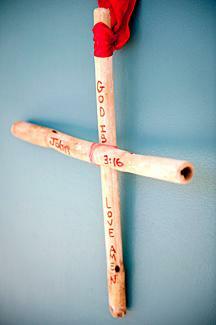 This simple cross will look lovely hanging on your front door. Divide the twigs into two, hand-sized bundles - one that is 2-feet long, and one that you'll trim down to 1-foot in length. Working with the 2-foot long bundle first, tie the twigs together securely with the cord, leaving an end long enough to use for tying off. When you have them tied, clip the other end of the cord, and tie the two ends together to secure. 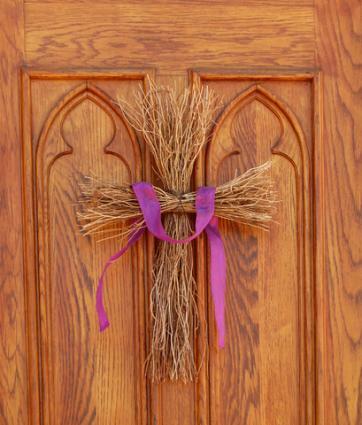 Repeat the same procedure with the 1-foot bundle of twigs to create the arms of the cross. Use more cord to bind the two pieces of the cross together and create a loop from the loose ends to use as your hanger. Drape the length of ribbon across the cross as shown and secure it to the back of the arms with a little hot glue so it doesn't blow away. Alternatively, you can tie the ribbon around the cross in a bow. This project makes a charming, aromatic Easter centerpiece. If you need something larger, consider making a group of three for the center of your table. Trim the block of floral foam so it fits inside the pot, but rests about 1 inch below the rim. Add a dollop of hot glue to the bottom of the pot and push the floral foam in on top of it. Coat the top inch of the branch with tacky glue and push it into the Styrofoam ball, being careful to center it as much as possible. Coat the bottom inch of the branch in tacky glue and push it into the floral foam base. Using the glue gun, begin gluing the potpourri to the Styrofoam ball. Make sure you cover the entire surface. You can use the leaves in the mix to fill in any bare spots. Use tacky glue to adhere the moss to the floral foam base and fill the top of the pot. The foam should no longer show after you cover it. This project makes a simply adorable centerpiece. After Easter you can remove the bunny, add a hanger to the back and use it as a door or wall wreath. Using the hot glue gun, glue the silk flowers and greenery (trimming away stems as needed) all the way around the wreath just inside the rim. You can make it nice and full, but it's good to still be able to see some of the grapevines. Lay the wreath in the center of your table. 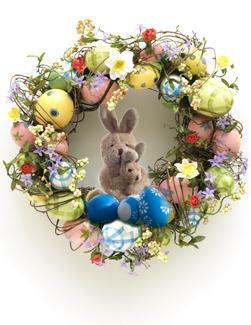 Place the bunny in the center of the wreath. 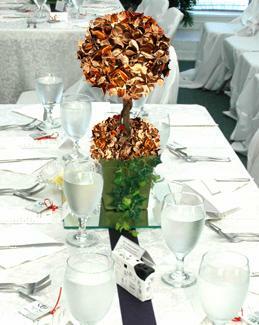 Add additional silk flowers and greenery around the rim if you think the centerpiece needs it. You can also add a smaller bunny to the bottom center of your wreath, as shown in the photo, to create a hanging Easter wreath. Before you begin any of these Easter craft projects, take time to read through the directions a couple of times and visualize each step. Once you thoroughly understand them it will easier to complete your project, and you'll have a lot more fun making your Easter decorations and keepsakes.